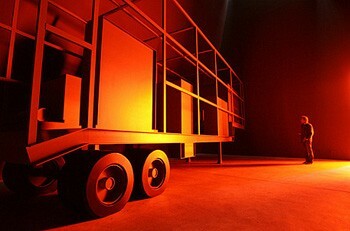 His "Phantom Truck" was displayed in the dark during docunmenta 12. Looking down at the Mies house. 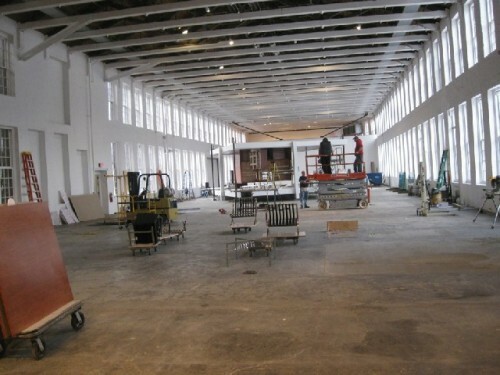 The vast space of Building 5 is the largest for contemporary art in North America. 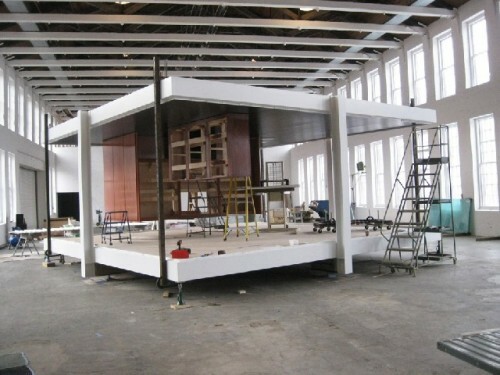 The upside down Mies house under construction. Furniture waiting to be suspended from the floor/ ceiling. Seeing how the work is coming along. 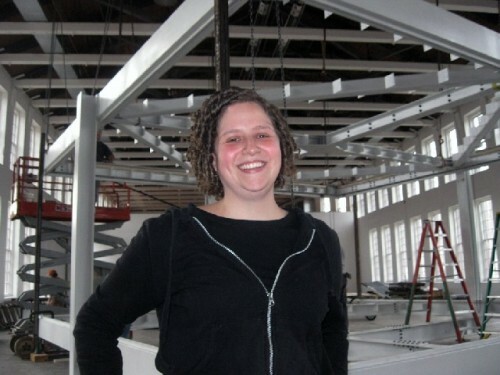 Curator Denise Markonish is looking forward to completing the project. 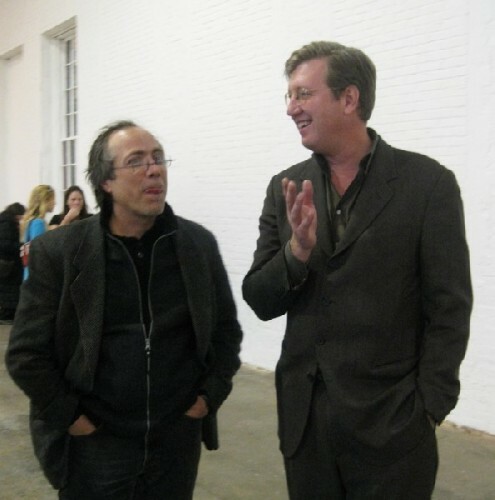 Inigo and Joe Thompson share a moment during the vernissage. 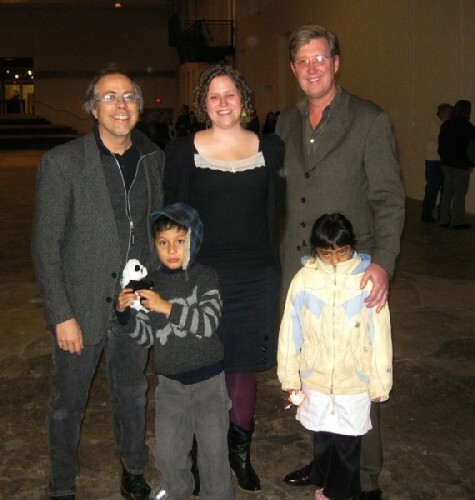 Inigo and his son with curator, Markonish, and MoCA director, Thompson with his daughter Isabelle. 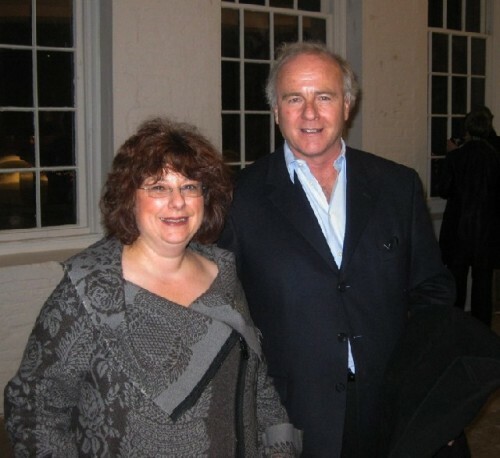 Museum directors, Lisa Corin, of Williams and Michael Rush formerly of the Rose Art Museum. She is currently showing Inigo’s work in her museum. 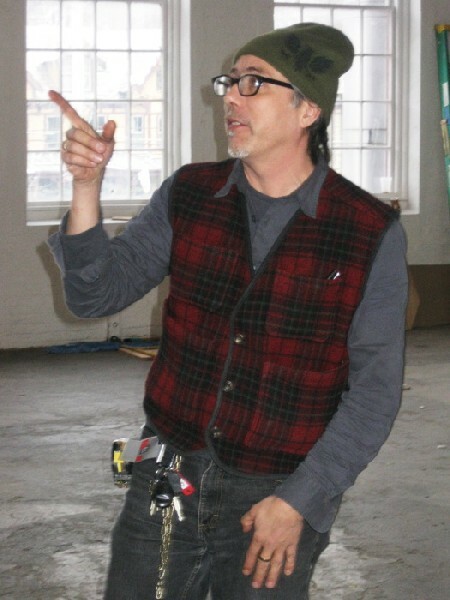 Michael Rush showed Inigo at the Rose and wrote about the work in Art in America. It was late Monday afternoon in Building Five, the largest special exhibition space dedicated to contemporary art in North America. 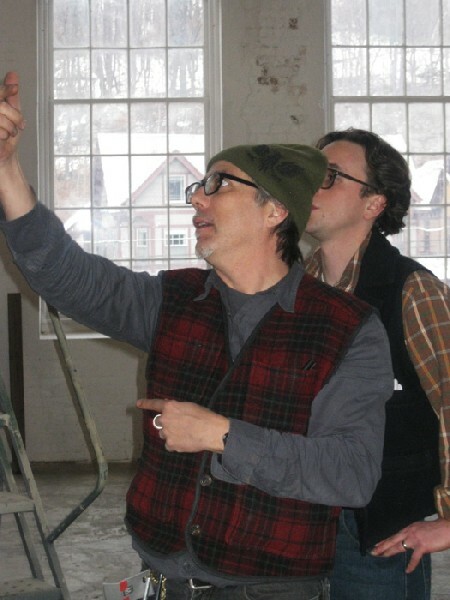 Richard Criddle, the chief installer, and his crew were working efficiently but intensely to complete constructing a new work by Inigo Manglano-Ovalle "Gravity Is a Force to be Reckoned With" in time for an opening at Mass MoCA on Saturday. We were introduced by the curator, Denise Markonish, with whom I had met a couple of weeks earlier during the initial phase of construction. They were just beginning the 50 x 50' frame of a creation of Mies van der Rohe's 1951 design, never before constructed "House with Four Columns." 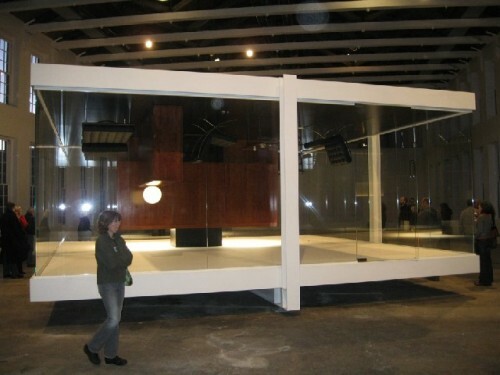 The glass walled cube was being installed, with its interior furniture, upside down. During that initial conversation Markonish explained that the project resulted from the confluence of three modernist monuments: The Mies house conceived but until now never constructed, the 1921 Russian novel "We" by Yeugeny Zamyatin, and a 1930 film it inspired by the Russian, Sergei Eisenstein, which was never completed. The novel about an dystopian, totalitarian society which later inspired aspects of Orwell's "1984" and Huxley's "Brave New World." The novel is set in a glass city where individuals are identified by numbers and dressed alike in uniforms. When they are granted permission to fornicate with approved mates, then and only then, are they allowed to pull down window shades. Transparency, surveillance, and repression were themes that informed Manglano-Ovalle's project. A Dystopia is defined as the often futuristic vision of a society in which conditions of life are miserable and characterized by poverty, oppression, war, violence, terror, resulting in endemic pain and suffering. This was the jumping off point for a dialogue with the charming, brilliant, and frenetic artist. We bounced about the space before I suggested we find a place to sit. 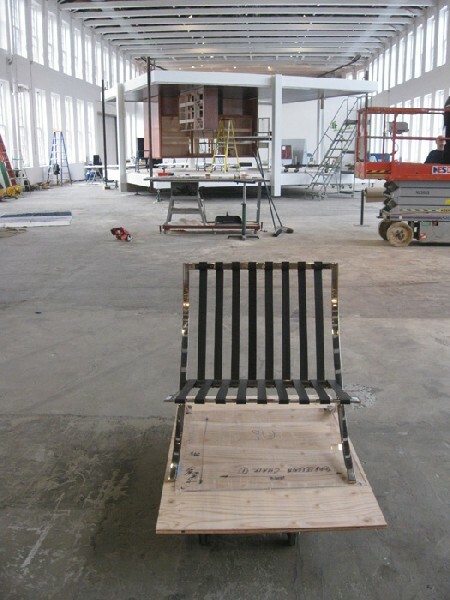 Ironically there were classic Mies chairs and furniture waiting to be installed but nothing suitable for just sitting. I suggested the steps to the vast space roughly the length and width of two football fields. 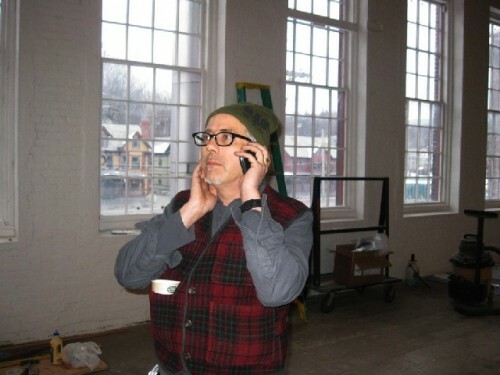 When Mass MoCA was just a thought in the mind of Tom Krens, then the director of the Williams College Museum of Art, on a Saturday morning, with a huge ring of keys, he took me on a tour of the campus. Most of the buildings were in varying states of disrepair. 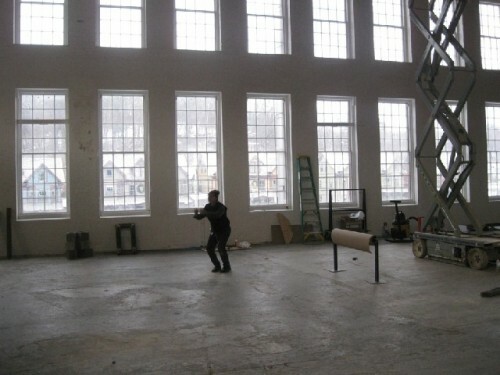 In Building Five he explained intending to take out the second floor and turn it into a vast vaulted space. The only other like it is in the Bilbao Guggenheim designed by Frank Gehry. Some ten years on Building Five has acquired a distinguished and complex history. Its first occupant was Robert Rauschenberg. Now that the artist is deceased it would be impossible to install that work. There would be too many restrictions by the Estate or owners as to climate control, which the museum lacks, and other conservation issues. 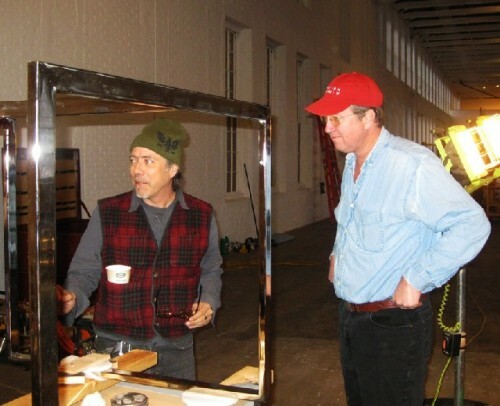 Part of the inherent success as well as risk factor for the museum is that it creates new works with living artists. There is a sliding scale of success. Some installations have been just glorious while others have bombed. The greatest disaster, an exhibition that never actually opened, was the mess with Christoph Buchel. Given the vastness of the space, which must be daunting to artists as I suggested to Inigo, are the options to either fill the void, or to leave it relatively empty. To make the space itself a factor in the piece. The glass is either half full or half empty. He acknowledged the intimidation and honor to be invited to make a project for such a unique and distinguished space but stated that his approach was not what I suggested or anything like what has been shown there before. I remarked that the "object," the inverted Mies structure, takes up no more than about 10% of the overall area. 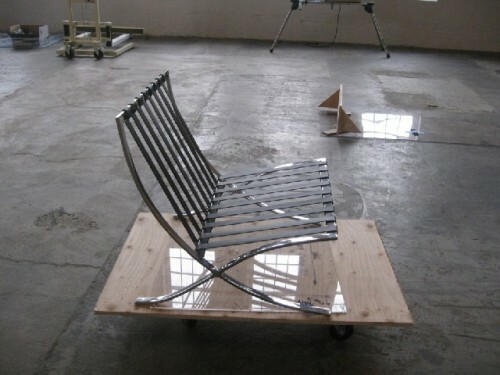 He agreed but added that he did not view the piece as an "object" or "sculpture" but rather as "architecture." He commented that it could be taken outside, installed right side up, and function perfectly well as a home. It is a common thread and concern in his work. He introduced the notion of scale and proportion. What Markonish referred to as the "approach" he discussed as the "promenade." It is how we experience monuments of architecture. At first, from a distance seeing the whole, then as we come closer, the parts and details. 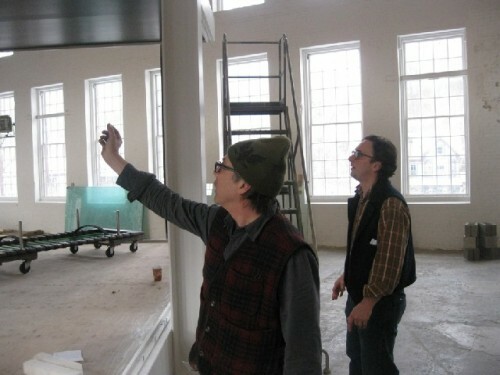 He speculated on at what point visitors to Mass MoCA will first perceive that the building is upside down. That sense of wonderment will increase as they come closer, walk around, and look into the structure. Come to discover and encounter its elements. Eventually, finding the cell phone which is, at intervals, receiving calls which they can hear by pressing close to the wall. Looking up they will see a glass coffee table, an ash tray, and used cigarettes. These are signifiers of a human presence and inhabitants who have vanished but left a trace. There is the broken cup on the floor which appears to have fallen from the table above bolted to the floor/ceiling. Is the visitor experiencing inverted modernist architecture or examining the clues of a crime scene? Something has or is happening. The artist has been inspired by a confluence of incomplete projects (Mies/Eisenstein) and the larger issues of modernism. The glass cube house is a metaphor and signifier. 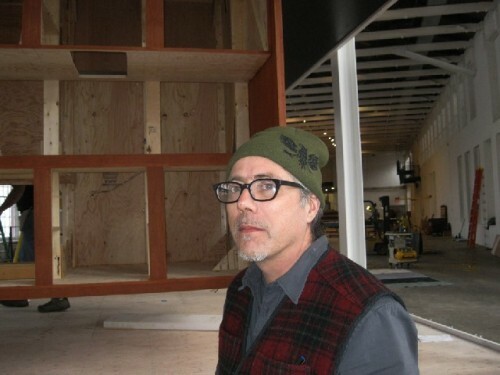 But he doesn't feel that the viewer needs to know or understand all that in order for the piece to work. He is more interested in how the visitor experiences and encounters the work. This is a key element in all of his projects. He explained the difference between looking at a work of art on the wall of a gallery or museum, a painting for example, as compared to the "cinematic" encounter with architecture which physically involves us. "In architecture we experience the aspect of phenomenology. I am interested in the cinematic aspect of real architecture. Outside it will work as a structure. Architecture must be experienced in space The event is how people experience the work rather than just take in the work like looking at a painting or object. We participate in the work in real space and time." He also discussed the political aspects of transparency- a glass house- as well as the scale shifts as we move around the space. 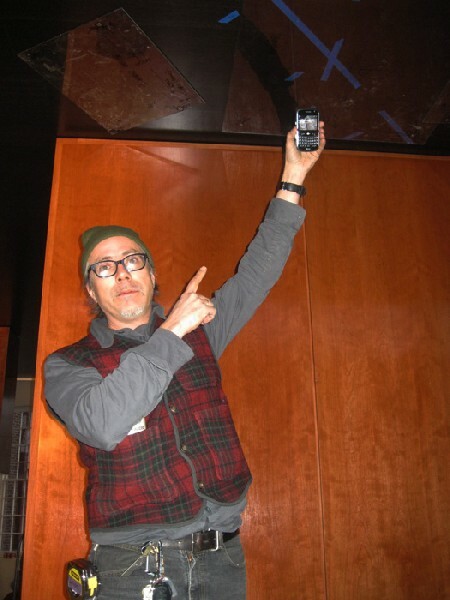 I commented to Inigo that I felt up to speed with his thinking about modernism having just seen MoMA's dense and insightful Bauhaus exhibition. His work was wonderful to experience but, quite emphatically, I do not want to live in a glass house. All that efficiency scares the crap out of me. A Mies glass house and "We" only exposes the chaos and disorder that are the norm of my lifestyle and aesthetic process. I would feel more comfortable living in an abstract expressionist house inundated with stuff and angst. 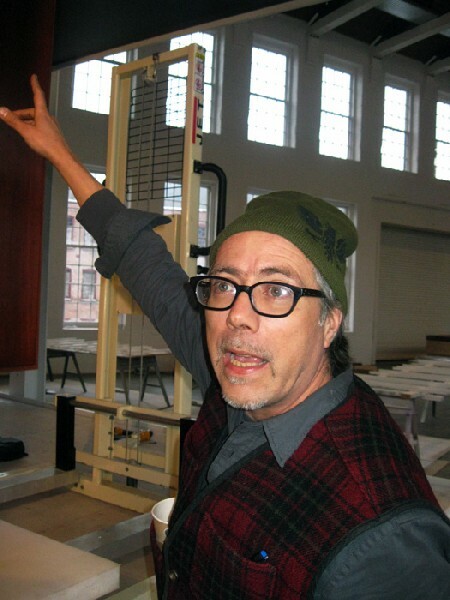 Encounters with artists like Inigo are intriguing and challenging. As we conversed there was an ironic whimsy. He would often punctuate a comment or insight with "right" and a look inquiring whether I agreed. It became humorous that more often than not it was anything but "right." But that just made us both laugh as the dialogue took intriguing twists and turns. Not every day one has a chance to go one on one, half court,with a MacArthur Fellow "Genius." 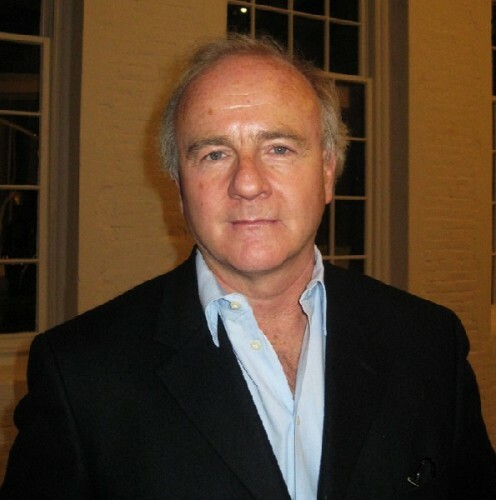 A Class of '83 graduate of Williams College, in 2005, he was given a Bicentennial Medal by the college. They were initiated in 1993. 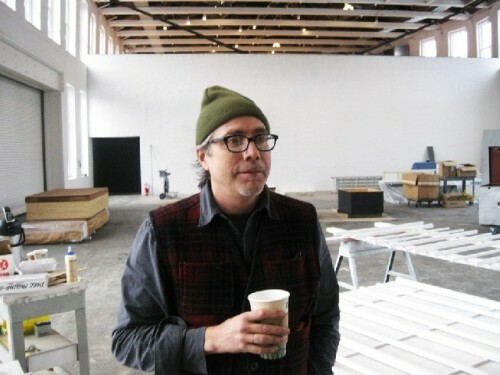 When he was on campus for that award there was discussion with the Williams College Museum of Art, that extended to Mass MoCA (its director, Joe Thompson is a Williams alumnus). What resulted was a plan for simultaneous projects. For Williams he is installing a six minute video loop called "Juggernaut." He explained the derivation of the word and how it informs the piece. On line this is what I found. "The word is derived from the Sanskrit Jagannth (meaning "Lord of the Universe") which is one of the many names of Krishna from the ancient Vedic scriptures of India. One of the most famous of Indian temples is the Jagannath Temple in Puri, Orissa, which has the Ratha Yatra ("chariot procession"), an annual procession of chariots carrying the murtis (statues) of Jagannâth (Krishna), Subhadra and Balabhadra (Krishna's elder brother). During the British colonial era, certain Englishmen promulgated a falsehood that Hindu devotees of Krishna were lunatic fanatics who threw themselves under the wheels of these chariots in order to attain salvation. The popular 14th-century work The Travels of Sir John Mandeville describes this act. In rare instances in the festival's past, people were crushed accidentally as the massive 45-foot-tall, multi-ton chariot slipped out of control, with others suffering injury in the resulting stampedes. This sight led the Britons of the time to contrive the word "juggernaut" to refer to examples of unstoppable, crushing forces. This includes British slang for a large lorry." In his work he described a white light in which we think perhaps that we are in or above clouds. At about mid point in the continuous loop we see the wheels of a very large, long truck. This is a force rolling over and arguably crushing the viewer/ devotees under it. Perhaps it makes us feel and ponder just what are those unstoppable forces, or juggernauts that rule our lives? The conceptual works of the artist often evoke elaborate and even outrageous metaphors. It is an acknowledgment of his success and recognition that he is able to create complex, expensive works. Seated on the steps and looking into the vast space I asked if this was his most ambitious piece? "Oh my God" he exclaimed "It ranks up there." This prompted him to discuss how he turned a cement bull fighting ring a short distance from the border in Tijuana into a vast radio telescope to search space for ET's. He suspended an antenna above the ring and receiving dish below it. Electronic music and FM radio was beamed into space. Regarding those aliens and ET's I asked if he had found any? Not really, he responded but noted that on the U.S./ Mexico border aliens are all around. There is probably more surveillance going on there than anywhere in the world. So the piece was an ironic twist on that. 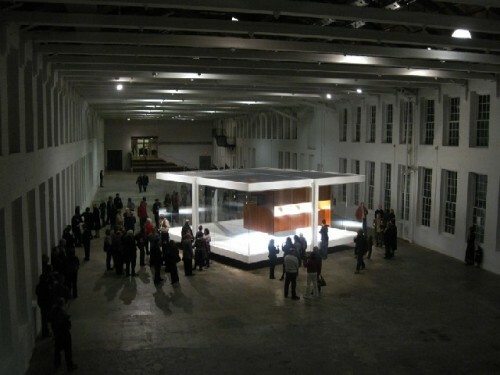 Just as ambitious was his commissioned piece for documenta 12 in Kassel, Germany in 2007. He created "Phantom Truck" based on the infamous Colin Powell report to the United Nations of mobile biological weapons vehicles alleged to be among the weapons of mass destruction used by Saddam Hussein. Powell displayed a rendering of the truck and the New York Times published photographs. But they later proved to be false. From the diagram of Powell, and photos of the alleged vehicle, Inigo recreated the truck in exact detail. This was then installed in an enormous room that was completely dark other than a "sliver of light." It took "about 30 seconds for the eyes of visitors" to adjust to the light level and begin to "see" the vehicle. He explained the meaning of the word "phantom" as derived from the Greek which is "to make the visible invisible." Placing it in the dark leaves it to visitors to determine whether the "Phantom Truck" is real. It evokes one to use all of the senses to experience the work. 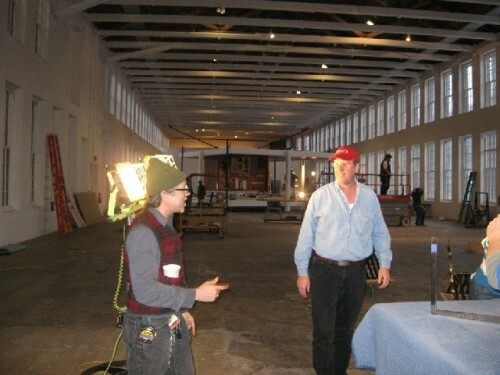 Coming back to the Mass MoCA work in process he said "It's my job to see that the piece can be experienced without knowing about Mies, the novel "We," or Eisenstein's unrealized film. Even if we don't have that knowledge the piece still functions. Just what do we have if we don't know this?" I suggested that those three questions recall Gauguin's "D'où venons-nous? Que sommes-nous? Où allons-nous?" He nodded assent. By then an hour had lapsed, sixty precious minutes. The crew was standing looking at him anxiously for input and a decision making process. They were, after all, literally building a house. But upside down just imagine the degree of difficulty involved. With a final burst of energy, Inigo is not inclined to stay put for an hour, he bolted off the steps taking me in tow. He was insistent that I experience the piece with him. I became subsumed in his, well, juggernaut of creativity. He was on a roll as he bounded up into the piece and cavorted about pointing to and explaining its details. Before my eyes he morphed into a Krishna. I bombarded him with photographs. It was one of those cathartic, charismatic moments when art and life swirl into a blur. You get lifted out of mind and body and slammed into the never never land of art experience. Until Inigo's cell phone rang. He stopped in his tracks with riveted attention. I took another photo this time a still life. Beginning to feel like an intruder I pulled back. The spell was broken and once again I was a stranger. There was anxious separation. What had been vanished. Phantom. Like groping around at Documenta. The phone call ended. There was something about in twenty minutes and something else in forty minutes. I sensed the importance to him of the precision of time and space. 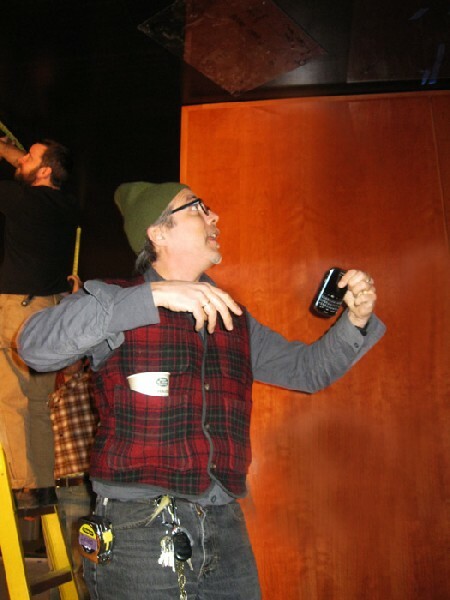 Then it was back to work as though that interval which I am reporting on never happened. On the way out I said hello to Joe and thanked Denise. She was anxious but whimsical. There was so much to do between then and Saturday. After which she plans to see the Bauhaus show. I slithered away thinking about modernism and its discontents. How the Bauhaus was closed by the Nazis. Totalitarian dystopia in that seminal novel "We" and an upside down house by Mies. Guess that's what's meant by post modernism. I stopped at Lickety Split to deconstruct it over a cup of coffee and some excellent 18 year old scotch that night. All shook up about people who live in glass houses. "Refreshing work and review in the 'take' on transparency in Modernism. . .I,too, live in an AbEx house -or, Equisite Corpse, depending on the day."